Good morning blogland. Happy Friday! I was too tired to blog this last night so here's a quicky. Not sure why my foot is up in the air. Maybe I'm feeling kicky. I'm always challenged to find something to wear underneath this dress because it's so low cut in the front and back. 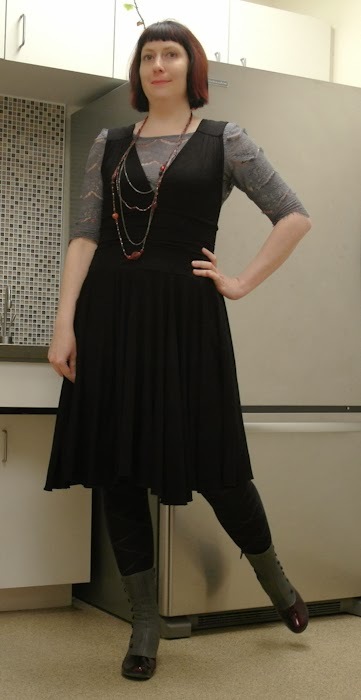 This shirt kinda works because of the grey on the boots. There's a zipper down the back. Puts me in mind of the episode of M*A*S*H where Hawkeye is telling BJ one of his fantasies. B.J. : Okay, it's your turn. Tell me a fantasy. Hawkeye: Picture, if you will, a crisp winter afternoon. You by a crackling fire in a smoking jacket. Hawkeye: Red... with blue satin lapels. And a zipper down the back. Hawkeye: You'll see. There's a light tapping at the door. "Who's there?" you say, checking your zipper. You saunter to the door, straightening your ascot... and casually slide back the bolt. B.J. : Come on! Who is it? Hawkeye: An angora sweater... with a zipper down the back. Hawkeye: She throws her arms around you. But you push her away! B.J. : I push her away? For what? Hawkeye: Your smoking jacket is covered with angora lint. In a fit of pique, she leaves. B.J. : That's it? The end? B.J. : But what about the zippers down the back? Hawkeye: They didn't catch on. B.J. : Oh, I don't believe it! I had Lana Turner in a fantasy with a sweater with a zipper down the back and I let her get away? Hawkeye: You always were short on zip. Speaking of Jackets, I found this coat in a vintage store on Ossington St. It was only $35.00! A bargain! Maybe it was so inexpensive because the sleeves are so short. The brand inside is Brown's Apparel, Huntington, West Virginia. I feel very conspicuous in this coat because most other Torontonians are wearing black or grey outerwear. Good thing I'm not too concerned about blending in. It's warm. Not -40C warm but warm enough for a reasonable winter day. And the back is pretty nice too. 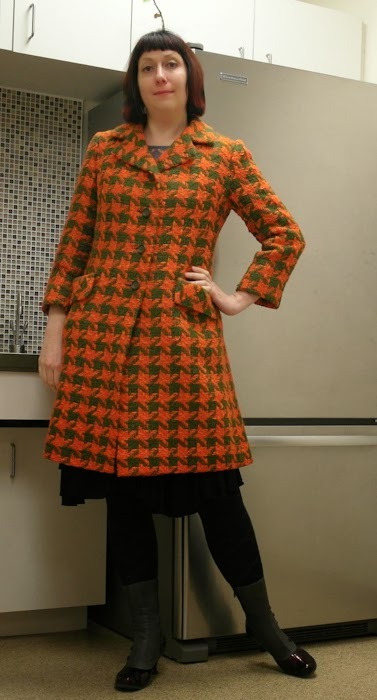 I love the shape and colour combination of that coat - all you need is some long gloves. I just got a deep pink Betsey Johnson down-filled coat on sale at a store here - I was so sick of wearing a black winter coat. There is so little colour in the landscape in the winter, I think it's our duty to brighten it up! I am glad you got back to blogging, Megan. I found your site a while ago. I enjoy your sense of style, it's quite unique, the choices of your clothing (where do you even find them? - I think to myself often), and your quirky sense of humor. Ha, you look elegantly comfy and intrepid! Your shirt and tights know each others' names. Tremendous coat, exactly perfect on you. So happy to be "seeing" you again! hurrah for not black outerwear, it's a gloriously pretty coat! and colorful and cute!! and it fits you so nicely!! Love this glamorous almost 20s vibe going on here. You are rockin' that coat. Maybe it was made for gloves? this Smart casual dress code is perfection. you look stunning and adore this post. Ooh, orange is my favourite colour! Maybe that coat was made for me and my short arms? Though it does look much better on you than it would on me. You go glow on the dark streets of Toronto! Anyway, glad you are back sometimes you need to take a break, there's real life after all! I love the coat, perfect for our grey and dull winters!